San Antonio couldn’t keep Denver off the glass on either end in Friday’s loss. Friday night’s 119-122 loss in Denver to the Nuggets was hard to watch, and it wasn’t just because of the result. The incessant calls of the officials made for a game that lacked rhythm for interminable stretches. Granted, many of the calls actually favored San Antonio, as they attempted more than twice as many free throws as the Nuggets: 39 to 19. The Spurs missed 10 free throws, shooting just 71.8% from the line, so it’s tempting to blame the erratic free throw shooting for the loss. But, even if San Antonio had shot their season average (77.5%), that still would have resulted in just two additional points, far from guaranteeing victory. Instead, the first area to look for blame is on the glass. Heading into the game, San Antonio ranked sixth in the league in defensive rebounding, snatching up 79.2% of opponents’ misses. 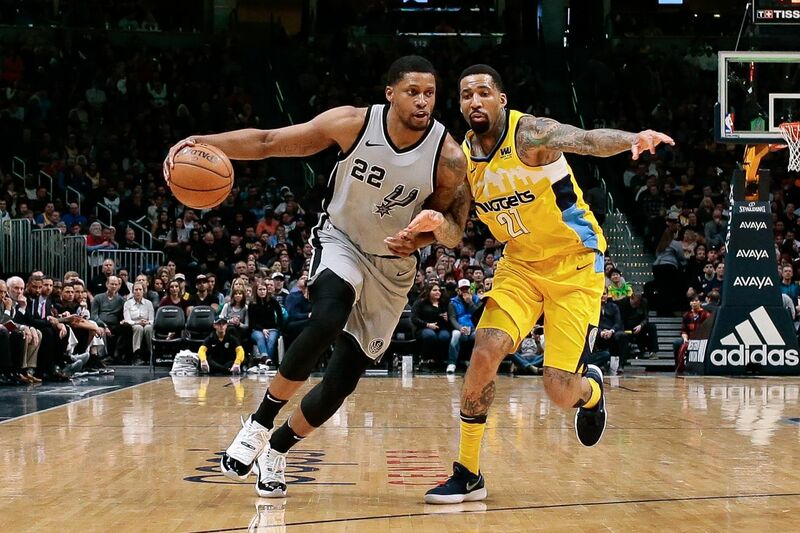 On Friday, the Spurs finished with just a 60% defensive rebounding percentage, a mark that would trail the league-last Atlanta Hawks’ average by 15%. Much of that disparity was simply due to boxouts, which NBA.com now records. The Nuggets tallied 36 boxouts compared to just 23 from San Antonio. For reference, the Oklahoma City Thunder lead the league in boxouts per game at just under 32. The Spurs’ inability to close out defensive possessions with a rebound led to 18 offensive boards by the Nuggets, resulting in 23 points and a whopping offensive rebounding percentage of 40%. Wilson Chandler finished with six of those offensive boards including these two for scores. LaMarcus Aldridge, for as brilliant of an offensive game that he had, only finished the game with five rebounds in 36 minutes. Compare that to Nuggets point guard Jamal Murray who finished with nine rebounds in under 35 minutes. The Spurs still play the majority of their minutes with two traditional bigs, which is a formula that has still been mostly successful this season. But, San Antonio cannot afford to let Denver shoot twice as many three pointers and dominate on the glass. The Spurs bigs actually did a very good job of protecting the rim on Friday night, allowing just 55.9% on shots attempted at the rim – an elite mark. 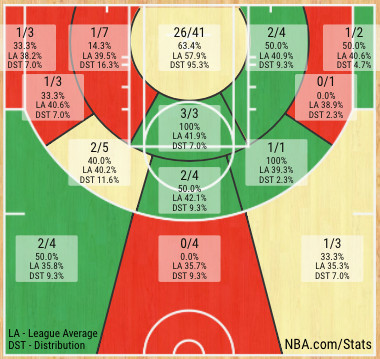 The bigger issue was the sheer volume of shots they allowed Denver to get at the rim – 34 attempts. 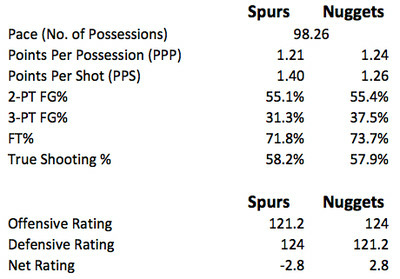 Heading into the game, San Antonio was giving up just 24 shots at the rim per game. When the first line of defense allows that kind of penetration, it’s difficult to play strong defense. 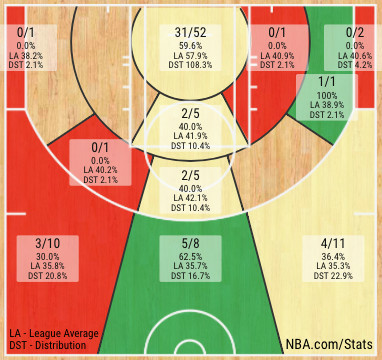 Even though 55% field goal shooting is a stingy number to allow at the rim, it’s not good for your defense overall. Per NBA.com, the Nuggets tallied 50 drives on the game, seven more than they average. 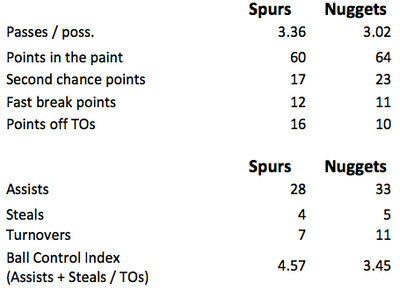 Going forward, the Spurs perimeter players will need to step up to prevent all those shots inside. I will not be addressing that Patty Mills floater and ensuing Gary Harris dunk at this time…it feels too soon. On to the next one.